Markazi Province , the medieval Iraq-i Ajam , more recently Arak - is one of the 31 provinces of Iran . The word markazi means central in Persian . In 2014 it was placed in Region 4 . 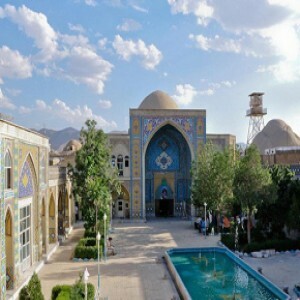 Markazi lies in western Iran . Its capital is Arak . Its population is estimated at 1.41 million . The present borders of the province date to the 1977 , when the province was split into the current Markazi and the Tehran Province , with portions being annexed by Esfahan , Semnan Province , and Zanjan . The major cities of the province are : Saveh , Arak , Mahallat , Zarandiyeh , Khomein , Delijan , Tafresh , Ashtian , Shazand (previously known as Sarband) and Farahan . Markazi province was part of the Median Empire in the first millennium BC , which included all of the central and western parts of modern-day Iran . The region is considered to be one of the ancient settlements on the Iranian plateau . Numerous remaining ruins testify to the antiquity of this area . In the early centuries Islam , the name of the area was changed to Jibal or Qahestan . By the early 10th century , Khorheh had become a famous city of Jibal province , followed by Tafresh and Khomein . In recent times , the expansion of the North-South railroad (commonly known as the Persian Corridor) and the establishing of major industries helped boost development in the area . Many figures in Iranian history trace their beginnings to this province . namely : Mirza Abulqasem Qaem Maqam , Abbas Eqbal Ashtiani , Mirza Taqi Khan Amir Kabir , Qaem Maqam Farahani , Mahmoud Hessabi , Ayatollah Khomeini , Ayatollah Araki , and many others . Markazi province consists of 11 counties and 18 districts (Khondab County has been added to the counties as of 2007) .